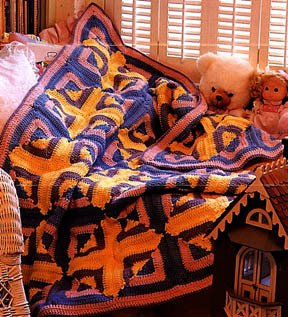 The popular log cabin quilt pattern has been adapted to yarn to create this colorful afghan. It's a great blanket for children when worked in pastels or for a more sophisticated look choose a deeper color palette. Afghan measures approximately 42" by 55". 6 rows = 3 1/4"
Remember to check your gauge. Use any size hook to obtain the gauge given. Note: Motif is started at the center, then worked in half rows instead of rounds (rnds). 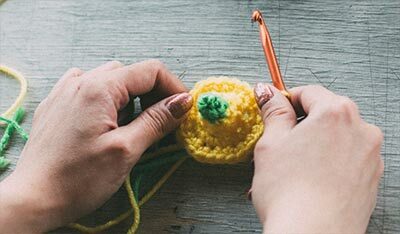 Motif (Make 48): With CA, chain (ch) 4, slip stitch (sl st) to begin (beg) ch to form ring. Row 1: Ch 3, 6 double crochet (dc) in ring. Ch 3, turn. Row 2: 2 dc in first dc, dc in next 2 dc, 5 dc in next dc, dc in next 2 dc, 3 dc in top of next ch-4. Draw loop (lp) on hook out to measure 2 inches, drop lp from hook. Row 3: Attach CB to ch-3 ring at the end of Row 1, ch 3; drop lp from hook, insert hook in top of last dc of corresponding row in previous color and draw dropped lp through--beg-of-row joining made, 6 dc in same ring; sl st in top of ch-3 of corresponding row in previous color­end-of-row joining made. Ch 3, turn. Note: Regardless of color, all beg-of-row joinings and end-of-row joinings are made in same way. Row 5: 2 dc in joining just made, dc in next 6 dc, 5 dc in next dc, dc in next 6 dc; leaving the 2-inch CA lp hanging free, make 3 dc in last dc. Ch 3, turn. Row 7: Ch 3, make a beg-of-row joining, 2 dc in top of CB ch-3 below, dc in next 6 dc, 5 dc in next dc, dc in next 6 dc, 3 dc in last dc, then make a end-of-row joining. Ch 3, turn. 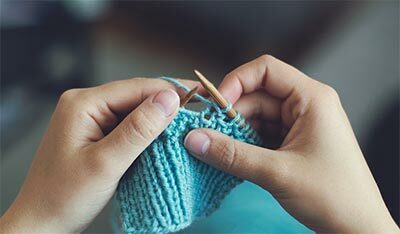 Row 9: Make treble crochet (tr) and dc in joining just made, dc in next 14 dc; make dc, 3 tr and dc in next dc, dc in next 14 dc; leaving the 2 inch CC lp hanging free, make dc and 2 tr in last dc. Ch 4, turn. Row 11: Ch 4, make a beg-of-row joining; make tr and dc in top of CD ch-4, dc in next 14 dc; make dc, 3 tr and dc in next dc, dc in next 14 dc; make dc and 2 tr in last dc, then make an end-of-row joining. Ch 4, turn. Row 12: Make a beg-of-row joining, work as for Row 10 then make an end-of-row joining. Fasten off. Holding right sides together whipstitch across CB edges to make a Block of 4 motifs. Make 11 more Blocks, then sew 3 by 4 Blocks together. Border: With right sides facing, attach CC to back lp only of first st following any corner. Rnd 1: Ch 3, dc in back lp only of next st and each st around making 2 dc, ch 1 and 2 dc in each corner st. Sl st to beg ch 3 to join. Rnd 2: Rep Rnd 1. Join. Fasten off. Rnd 3: Attach CD to any st, sc around working 3 sc in each ch-1 corner space. Join. Fasten off.